The project will provide interior and exterior recoating and upgrades to the welded steel 803-2 Reservoir. The official name of each reservoir relates to its location above sea level. Service will not be interrupted during the recoating of the reservoir. 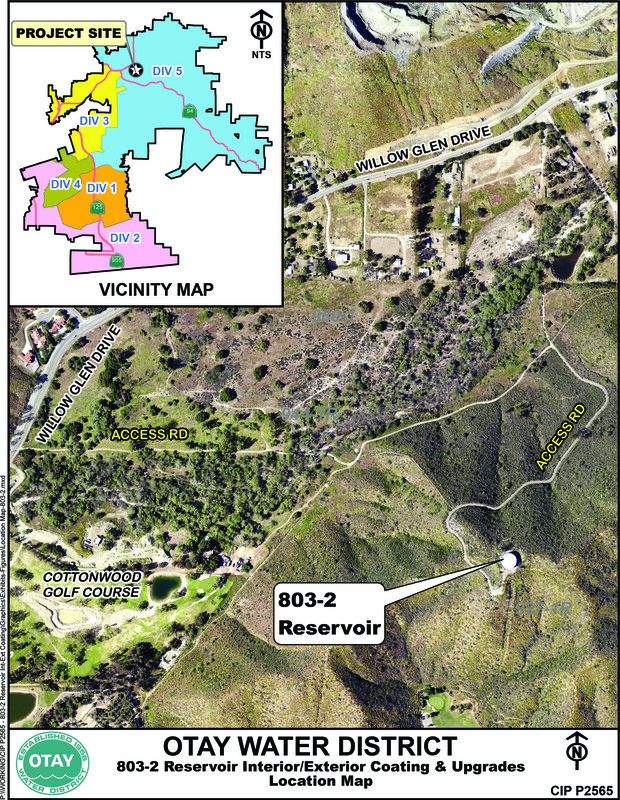 Otay Water District and Advanced Industrial Services, Inc.
Recoating reservoirs is standard maintenance that preserves the quality and safety of customers’ water supply by maintaining the integrity of the storage structure. Customers save money over time when routine maintenance is performed on a regular basis. No water service disruptions are expected during the recoating and upgrade work since each zone has a redundant reservoir for the service area. The District’s budget for the 803-2 Reservoir Interior/Exterior Coatings and Upgrades Project is approximately $1.2 million. For additional information about the project, please contact the Project Manager Kevin Cameron, PE, at (619) 670-2248 or via e-mail at kcameron@otaywater.gov.